Clinging tight to the cold, grey asphalt, the old man refuses to budge, trying to protect the statue from the crowd. With the intimacy of a lover forced to separate from his loved one, the man strokes it until the crowd pries him away. “C’mon grandpa, it’s time for you to move,” a man shouts. Others are not as friendly, chanting “we will dig you a grave next to your dear Lenin, look at how he loves this piece of garbage!” Hands are dragging the man away, still clinging to the Lenin statue that’s lying on Bessarabska Square in the center of Kyiv. This scene in the documentary All things Ablaze (2014) by Oleksandr Techynskyi, Aleksey Solodunov, and Dmitry Stoykov depicts the events of December 8th, 2013 when the Lenin statue was toppled during Euromaidan, also known as the Revolution of Dignity. What followed became known as the Leninopad, or “Lenin-fall,” a nation-wide toppling of over 5,500 statues. In light of the unofficial 5-year anniversary of Euromaidan, Ukraine is at a crucial turning point in its history and is trying to erase all links to its Soviet past. One could argue that the old man on Bessarabska Square did not stand a chance in protecting Lenin’s Statue, a representation of Ukraine stepping out of the Russian orbit. Decommunization was implemented by law in 2015, and the crucial tasks of re-evaluating the country’s remembrance policy and historical narrative has been given to the Ukrainian Institute of Remembrance (UINP). As the country now seems busy with writing a one-sided narrative of itself and replacing communist symbols with controversial historical figures, we have to ask ourselves: what symbolically fell on December 8th, 2013 and how are Ukrainians feeling about it today? Ukraine’s attempt to straighten out its history should come as no surprise as times of war require heroic narratives. However, the UINP sees its job as not only decommunizing all public spaces, but, more ambitiously, people’s minds. Among the problematic actions taken by the institute and affiliated actors, such as the Ukrainian history magazine Istorychna Pravda (True History), is the positive re-evaluation of the Organization of Ukrainian Nationalists (OUN) and one if its military wings, the Ukrainian Insurgent Army (UPA), which was established during World War II. The UPA fought both Bolsheviks and Nazis during the war, and have been deemed “freedom fighters” by UNIP. By officially giving status to the UPA through “The Act on the Legal Status and Honoring the Memory of the Fighters for Ukraine’s Independence in the 20th Century,” the institute seeks to glorify all forces that were “not outright affiliated” with clear Nazi German factions such as the SS Halychyna (Galizien). This becomes problematic as UPA membership seems enough of an indicator for non-affiliation, while more often than not UPA fighters were members of both sides. It is well documented that between 1943 and 1944, UPA soldiers received training by the Auxiliary Police known as Schutzmannschaften, the official Nazi-German police. Additionally, it is a well-established fact that the UPA fighters were the main perpetrators during the Volhynia massacre in 1943, a violent purge of ethnic Poles from the western borderlands of Volhynia in the name of creating an independent Ukrainian state. By promoting the UPA, the UNIP is strongly brewing a new national consciousness that strengthens the idea of an all Ukrainian nation while eradicating any traces of a shared history and culture with Russia. Simultaneously, it is also cleansing all minority narratives that are part of the country’s history while elevating Nazi-affiliated military groups. The dangers of this are multifaceted; it allows for a sterilized and inaccurate depiction of a linear historical past that has never existed, while contributing to the alienation of historical ethnic groups. Furthermore, this narrative stands in stark contrast to the Soviet belief that saw ethnicity, such as being Ukrainian, Belarusian or Jewish, as secondary to Soviet identity and being a Soviet citizen. Therefore, the commemoration of war victims has followed the slogan “victims should not be divided.” Unfortunately, this has not prevented Kyiv from strengthening a historical narrative that makes the crimes committed against Ukrainians purely ethnic ones, which Moscow has interpreted as proof of Ukraine singling itself out from the Soviet Union and wallowing in nationally induced victimhood. Overall, changing the political narrative in favor of the UPA has been particularly successful in western and central Ukraine while significantly less in the eastern and southern Oblasts. The lack of success in the south-east of Ukraine is a result of the nationalistic narrative that often alienates Russian speaking citizens from these territories. More than 50 percent of the population speaks Russian as their native language, and there is a strong entwinement of Russian culture as well as the myth of the Great Patriotic War (the Russian name and narrative for World War II). Such identity markers have proven hard to erase without creating an identity vacuum. As Ukraine is also departing from using the term “Great Patriotic War” and instead using World War II, the focus of Ukrainian history has been on the struggle and victory over Germany. Since the UPA was denounced in Soviet history as fascist collaborators, it does not come as surprise that Russia called active Maidan participants “Banderofascists,” referring to the controversial military leader Stepan Bandera. Bandera, who led a wing of the UPA, is also largely associated with the Volhynia massacre. Nonetheless, from the perspective of Ukrainians drawing on UPA traditions in which they only view them as positive uncontroversial freedom fighters is understandable for a country in hybrid warfare with Russia. Russian propaganda also seems incredibly persistent in actively denouncing all Ukrainian state-building attempts as a fascist coup d’etat. Due to both countries’ strong historical intertwinement, the status of Russian language in Ukrainian media makes it easy and efficient propaganda targets. By actively rewriting Ukrainian history, much emphasis has been put on promoting the Ukrainian language, despite it being less successful as a marker of identity language than socio-political and historically caused regionalisms in the country. This is often an overlooked factor at the heart of the current war in Ukraine’s eastern territories that is disregarded frequently in favor of simplistic west-east divisions. Concluding all attempts to cleanse the Ukrainian historical narrative has a strong potential to alienate sizable parts of society and increase current existing conflicts. A figurative example of this is the old man clinging onto a statue of Lenin, unable to part with a large chunk of his identity. Unfortunately, we’ll never know what he thought; society decided he was on the wrong side of history. The toppling of statues has been part of a deep-rooted sentiment within Ukraine to finally close the chapter with its Soviet past. Belonging to the strategy of reorienting the country towards Europe, decommunization had officially been enforced in 2015. The last visible ties with the oppressor seemingly had been cut by banning all Soviet symbols and taking down the remaining Lenin statues. With a continuation of the decommunization campaign started during the early 90s under President Leonid Kravchuk in which much of western Ukraine had already been successfully decommunized, it was again the central and south-eastern oblasts that seemed to lag behind. The toppling of Lenin during the Revolution of Dignity was the turning point that sealed the deal. Only with the symbolic fall of Lenin at the heart of Kyiv was it possible to officially ban all totalitarian symbolism recognizing the “Communist totalitarian regime” as well as the “National-Socialist (Nazi) totalitarian state.” Levelling both the Communist (mostly referring to Stalinism) and Nazi regimes is in line with other such evaluations in the Baltic States. The spreading of propaganda linked to either regimes therefore results in a criminal offense, and the banning of the Communist Party of Ukraine was a direct result. Kicking off a six-month period in which every remaining Lenin statue in Ukraine was taken down, the so-called “Lenin-fall” resulted in the removal of 1,320 Lenin monuments and 1,069 related busts of Communist figures. 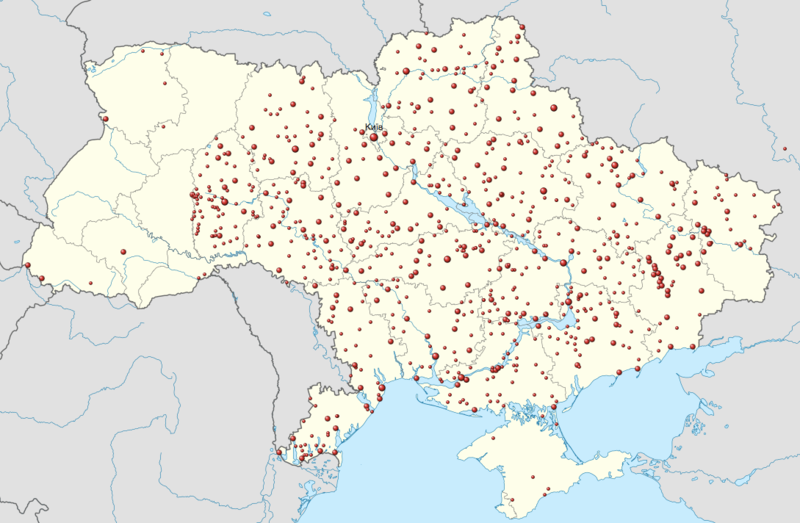 While the majority of WWII memorials were left untouched, a total of 25 communities, 987 places and 32 cities were renamed, plus an additional 52,000 streets and squares, an action costing the Ukrainian state a total of $1.5 billion. Communist holidays were replaced by national ones, and all Soviet elements were removed from the Ukrainian army. While the 2017 statistics showed mixed attitudes of the population towards these removals in Kyiv, most were against them (69 percent) during times of the mass protest, 13 percent were in favor and 15 percent remained neutral on the issue. Particularly, the renaming of 34 street names after Stepan Bandera and other UPA leaders caused controversy. Ukraine seemingly was in need for national heroes due to its ongoing proxy-war in eastern Ukraine with Russia, which explains the adoption of the UPA freedom fighter’s narrative. Overall, the removal of Lenin statues in public places symbolizes Ukraine’s departure from being dominated by Moscow and setting off towards an all Ukrainian path. Some claim a nation at war has no time to deal with its own national narrative, yet this is exactly what separates solid democracies from other systems. Talking with the political opposition inside and outside of the country could be interpreted as weak in Ukrainian politics and a dark foreshadowing of the future for Ukrainians. These crucial years of elites reconciling the country’s remembrance policy will make or break Ukraine’s political transformation process. By giving into its lowest anti-liberal instincts and manipulating public discourse, the current government follows the tradition of Soviet oppression and keeps its citizens submissive. Indeed, it might be the exact opposite of what brought people to Maidan Square in 2013; by eradicating the symbols of a totalitarian regime, Ukraine actively promotes repressing collective trauma rather that dissolving it. The consequences of the latter will only be visible in the years to come, but the more illiberal regimes in Hungary and Poland might give us a glimpse of what could happen with a stable and politically consolidated Ukraine. Ukraine is still far away from this scenario, but there’s one thing we know for sure: a continuation of the remembrance and memorial policy will potentially lead to deteriorating relations with the European Union. While many in Ukraine have given up on the dream of joining altogether, priorities seem to have been laid with the creation of a zero-sum game between Ukraine and Russia. As much as creating an active enemy helps for patriotic mobilization, it will leave long-lasting traces on Ukrainians’ collective memory. If Ukraine continues to be unable to accommodate different interpretations of political narratives, it will not only alienate its own citizens but also fail to live up to the ideals of the Revolution of Dignity, a decision Ukraine might regret in the future.